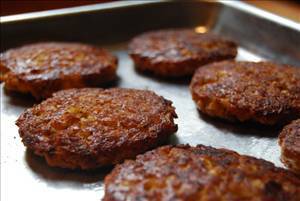 Vegetarian burger patties, great on a bun, with gravy, in a casserole, or just plain. Turkey Joes made in the slow cooker. A very tasty low fat, gluten free and high protein snack or main. Salmon is great alternative for ground beef to make burgers. Lots of different flavors combine to make a delicious salmon patty. Grilled turkey burgers with a Southwestern flavor. Yummy vegetarian black bean burgers. Very tasty beef burgers in Kaiser rolls.